We know you're just trying to help. As they say, the road to hell is paved with good intentions. And yet, you still might be surprised to learn that a server's biggest problem can be a well-meaning patron. "We love all our guests—especially the ones who go out of their way to be pleasant and helpful," assures Suzanne Perry, co-owner of Datz Restaurant Group in Tampa. But there's a difference between a guest who quickly mops up a toddler's spill and one who takes a martini glass off a tray full of drinks. "Sometimes a kind and helpful guest can be a server's nightmare." So be nice—by not making these sweet-but-annoying gestures to your server. 1. You grab something off his or her tray. We know you can be anxious to get your glass of Merlot, so when you see it teetering on the edge of your server's tray, you reach for it. From your perspective, grabbing that glass helps lighten your server's load. But grabbing your glass off a tray doesn't do anyone any good. "You may think you're helping by reaching for that front martini or pint glass, but chances you—or your server—will be taking a bar bath," warns Perry. As a rule, "please just don't do it." 2. You pre-bus your own table. You're done eating, so why sit with empty, unused dinnerware in front of you when you can stack up your plates, bowls, and silverware? It's a nice thought, says Perry. 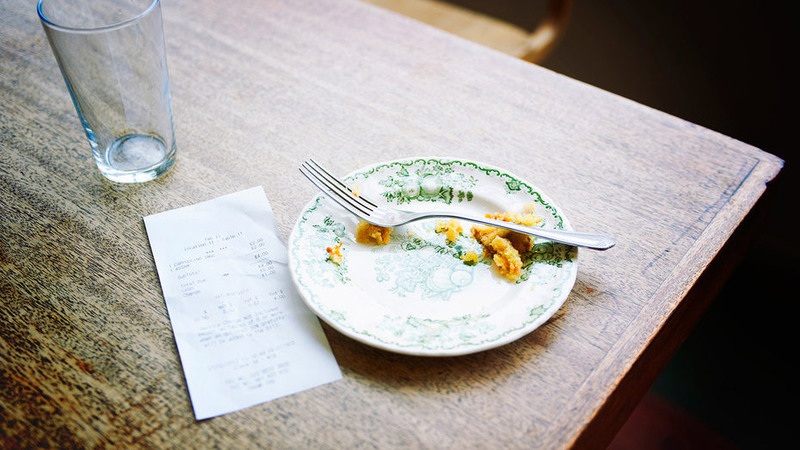 "But handing a server a stack of plates, layered with food and silverware that isn't balanced—and plopping a wad of napkins on top—is a little insulting and messier than it really needs to be," she warns. "There is a method to the stacking madness. So let the pros handle it." 3. You hand over your payment—regardless of whether anyone else is ready. You probably know by now servers don't love multiple checks. So when your server comes to your table with four bills spread across your party of eight, you are ready with your credit card already out. One less thing for your server to worry about, right? Wrong. "When a server drops off several checks and one very prepared guest immediately hands over his or her credit card, before anyone else at the table has even looked at their bills, that's not helpful," Perry warns. In fact, "it actually slows down the cash out process for the whole table." Instead, Perry suggests, "unless your wife is going into labor, just wait until all of your party is ready with their checks, too." 4. You fill up your own glass. Your server seems busy, so rather than bother her for a water refill, you sidle up to the bar and pour from the pitcher yourself. That's all well and good—until a manager spots you and dresses down the server for neglecting her duties. "Your server may be at another table or in the kitchen getting your food, but helping yourself only makes everyone look bad," says Perry. "If you're getting bad service, ask to speak with a manager. But helping yourself isn't helpful." 5. You try to get your server to share some quality time with your little one. Your child is adorable, so why wouldn't your server enjoy stepping away from the dinner rush for a little time with him or her? (After all, listening to your kid sing the ABCs has got to be more enjoyable than taking orders from the grouch one table over.) But as cute as your child may be now, his or her temperament can change in an instant—leaving a server to place a plate in front of a screaming kid. And that's one reason Perry recommends you keep your child as separate from the server as possible. "We understand that your little person may be excited or over-tired," says Perry. "Do your best to take care of their temperament without knocking the server over. Oh, and letting your little one unravel the server's apron? That's a no-no." What Servers Really Think When You Ask to Have Food "Wrapped Up"